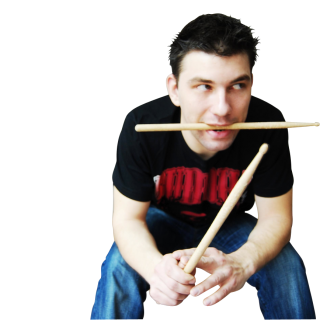 I started to play drums when I was 16 years old with "Otpor", a drummer from the streets of Serbia. I then realized that I really wanted to be a drummer. Some friends and I started to play some EX Yugoslavian rock songs such as: "Riblja Corba", "Van Gogh", "Prljavo Kazaliste", and "Yu Grupa". After a couple of months we decided to name the band "NIB" (a Black Sabbath song). We also played Metallica, Black Sabbath, and Megadeth. A couple of years later I joined Art Diler, which is the band that I currently play in. We have recorded two albums and have some other projects as well. During my early drumming days I was heavily influenced by Hard Rock and Heavy Metal drummers. Besides playing the drums, I study Polish, photography, and work as a Dee Jay. Jeff Porcaro, Simon Philips, Deen Castronovo, Denis Chambers, Chad Smith, Ian Paice, John Bobham, and Hena Habberger. Bands that have changed my life: Toto, Journey, Led Zeppelin, Doors, Deep Purple, AC/DC, Phil Collins, Gotthard, Whitesnake, and Santana.